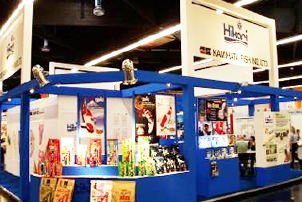 Kamihata Fish Industries Ltd. recently exhibited at Interzoo 2006, the world's biggest international pet business exhibition held at Nuremberg Messe, Germany. Here we announced, we would resume exporting of Hikari fish food to EU member states beginning this summer. You will soon, one again, be able to obtain Hikari fish food your aquatic pets who have been eagerly awaiting their preferred diets! Our Saki-Hikari koi diets, the revolutionary product line that has produced consecutive Grand Champions at the All Japan Nishikigoi Championship. 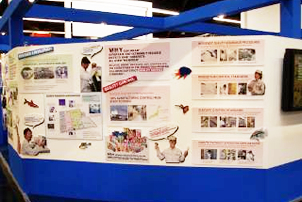 At Interzoo, we explained our highly sophisticated and completely monitored quality control system. We are very proud Hikari's aquatic diets are produced under such strict quality control procedures which allow us to consistently offer our worldwide customer base the best aquatic diets available today! 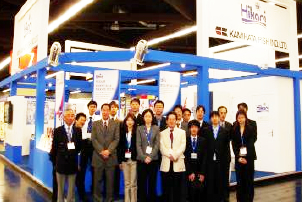 Staff from each division of Kamihata Fish Industries Group, thank you for taking the time to visit us in Germany. Danke.